Fuller brows are all the rage these days. Makeup lovers can attest that a makeup kit is not complete without eyebrow tools such as pencils, pomades, powders or gels. It’s an everyday ritual for us to draw and shape our brow arches. However, other people find it a hassle especially when the makeup formula is not sweatproof or waterproof because it takes more time to draw, shape and retouch their brows. Fortunately, eyebrow tints are now easily available in the market with promises of perfectly-shaped and well-groomed eyebrows that last for three days, maybe even more. With results that last longer than traditional eyebrow cosmetics, it immediately became a cosmetic hit! If you’re planning to leave the busy streets of Manila to hit the beach this summer, eyebrow tints may not be your best friend in keeping those brows on fleek. Due to the heat of the sun and splashing waves, tints are expected to fade faster than usual. But you don’t have to worry as there is another solution: eyebrow microblading. Eyebrow microblading is a form of semi-permanent makeup that also promises perfectly-shaped and well-groomed eyebrows. It is performed by a certified eyebrow technician. The treatment involves using an embopen (a handheld tool with nanoblade) dipped in special pigments which are carefully chosen to match your natural hair color to achieve a hyper-realistic look. The eyebrow expert will create tiny hair-like incisions to your skin using fine blades. Pigment is then embedded into these small incisions. The result will be fuller-looking brows that can last up to three years (depending on your skin reaction, lifestyle and maintenance). If you consider undergoing this procedure, you have to say goodbye to tinting at least one month prior. According to the best beauty artisans in Manila, one of the pre-microblading rules is to refrain from modifying your eyebrows (even through waxing, tweezing, threading and tinting) as this can irritate the skin. Moreover, the ingredients of tinting products have a high chance of reacting to microblading pigments and may tarnish the results. Plus, it makes it difficult for the eyebrow technician to see your existing brow hairs and work on them in the best ways possible. But if you are the type of person who refuses to go out with undone brows, you can still fill them with other eyebrow makeup. Doing so will help the expert to understand the color and shape you feel most comfortable with. 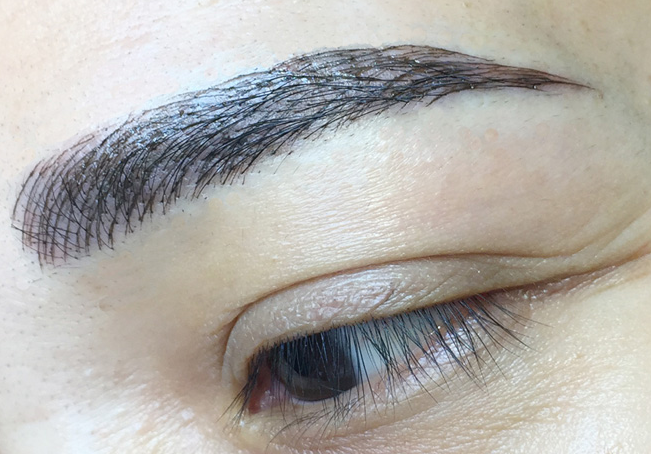 After making a pattern from your preference, the technician will then remove your makeup to ensure that your brow area is clean before proceeding to microblading. Other than that, all your regular brow maintenance such as tweezing, threading, waxing or tinting may continue once the brows have healed. To learn more about pre- and post-microblading rules, you can visit the best cosmetic clinics in Manila. Achieve your #KilayGoals with the help of eyebrow experts!